The Life of Mo: Our adventures in growing veggies begins! Last year I was really excited to have a garden. Really since we bought our house with a biggish backyard that gets good sun, I've been daydreaming about it. 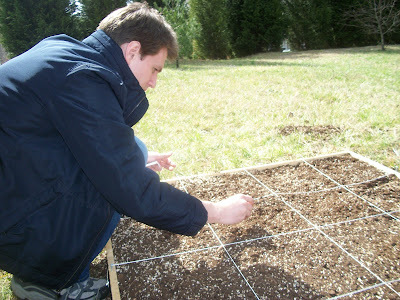 But I got really serious last spring, and I read two books that really helped me formulate a plan - Square Foot Gardening by Mel Bartholomew (there's also a pretty helpful square foot gardening website) and The 20-Minute Vegetable Gardener by Tom Christopher and Marty Asher . Both books advocate building raised beds with a special mix of soil so you don't have to do lots of digging and weeding to grow veggies. Last spring we just couldn't find the time with a little baby and both working full-time. But this year, with me working at night and Matt unemployed, we could do it! 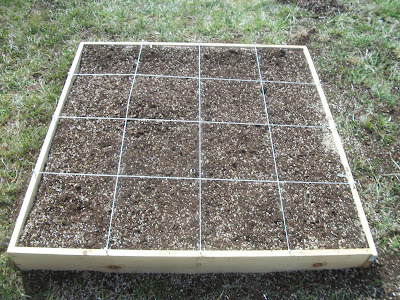 So last week with Dassa here to help entertain Cadie, Matt dug out a 4 ft by 4 ft patch in our lawn, built me this raised bed, filled it with the prescribed mix of compost, peat moss, and vermiculite, and then made a nice square foot grid with nails and twine. Cute, huh? 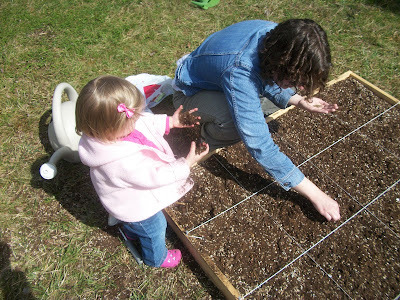 Here I plant carrot seeds while Cadie plays with the dirt. She really liked the dirt. I know it looks like she may be eating dirt in this picture, but she wasn't, we promise. 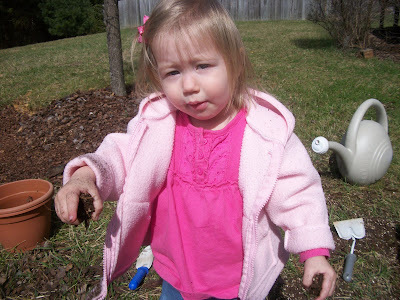 We did let her hold the little spade for a minute and she licked it (I guess it looked like a spoon?). We were both right next to her when she licked it and quickly took it away and said "Ew - not for eating." By the look on her face, I don't think she'll try that again. This is so exciting! I am envious. If I tried it in our backyard I think the rabbits and deer would eat anything that grows. You all did a great job. I might need to get Cadie her own set of gardening tools! Enjoy! Love the garden, love the pictures. Cadie will be a big helper when the veggies come in. Keeps us posted when things start coming in.